BeFaster Lite is a multi-language internet speed up toolkit with some powerful tools. It is light version of BeFaster. It optimizes AOL, Symantec PcAnyWhere, IE, Opera, Dial-up modem, Lan, Cable Modem, xDSL, ISDN, T1, DirecPc and Cable/DSL running PPPoE. You can configure settings automatically. 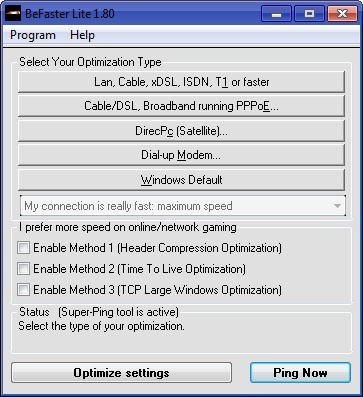 You can optimize your online/network gaming speed easily. Its Super-Ping Tool prevents connection drops and its Ping Now Function awakes suspended modems. Easier and better with multi-language support (over 26 languages). Its live update property will make you informed about the new versions. This program is designed for Windows.